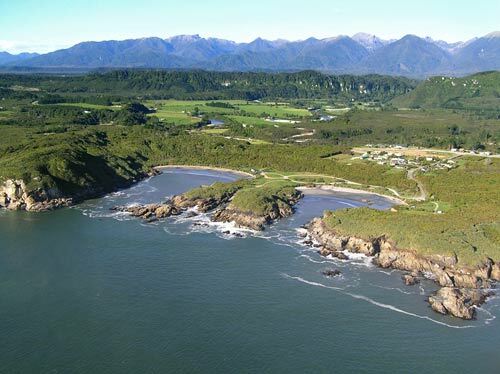 This aerial view of the Charleston area shows limestone bluffs, and the Paparoa Range in the background. The present settlement of Charleston is centre right. The right-hand inlet is Constant Bay, which was used as a harbour in the 1870s and 1880s. It now seems hard to believe that ships could negotiate this tiny entry, but it was the only way to land stores and people along a rugged coastline.